Citation: Gregory, J. L., & Prana, H. (2013). 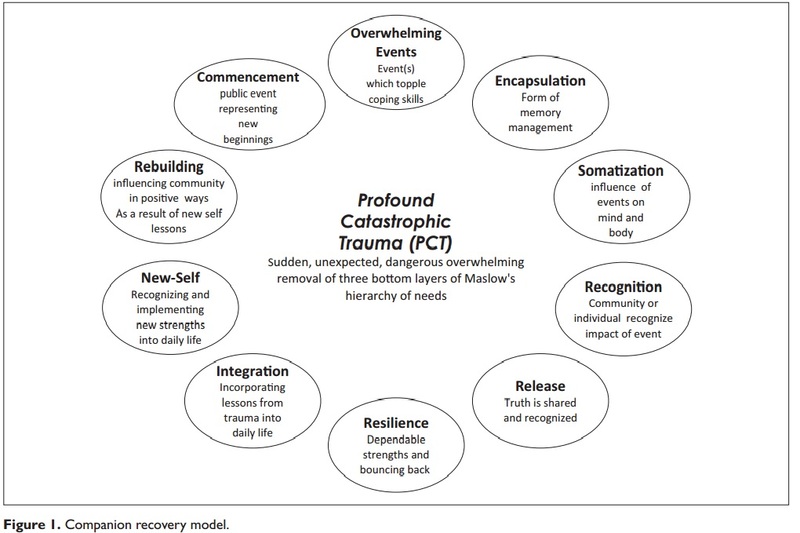 Posttraumatic growth in côte d’Ivoire refugees using the companion recovery model. Traumatology: An International Journal,19(3), 223-232.
approach assists in discovering a freedom from symptoms as a result of unresolved issues negatively affecting emotional growth and development (Latner, 1992). This method of intervention was used in significant ways during the Release portion of the CR model. Cognitive behavioral therapy assists clients in appreciating the important role of thought in determining both feelings and actions. If unwanted feelings and behaviors are recognized, it is important to identify the underlying thinking that may be causing them. Clients learn the importance of reframing counterproductive thinking with thoughts leading to more desirable actions (Beck, 1995). This form of educational redirection was offered throughout the 36-hour training. person-centered, nonjudgmental, and nonevaluative context (French & Harris, 1999). Coupled with peer support, TIR was offered throughout the training. 5. Resilience training and dependable strengths articulation (Haldane, 1975) exposes participants to nature and characteristics of resilience and the relationship self-care plays, and includes identification of personal strengths. Much like building muscles, clients are taught to practice specialized “bounce back” strategies (Grotberg, 2003).